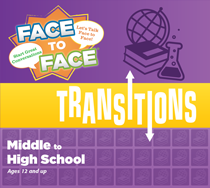 Face to Face Transitions games include 96 question cards that ask players questions that stimulate lively discussions on the major transitions in life. 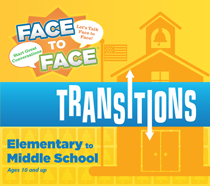 Transition and change are difficult realities. Learning to handle them is a critical life skill. 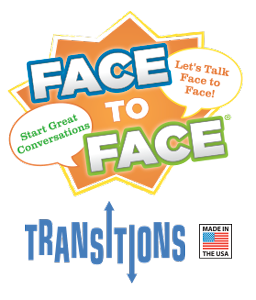 Face to Face Transitions is available in four versions, each addressing different transitions in life. 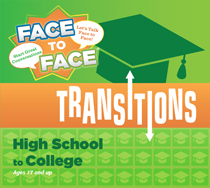 Your parents seem to be so busy on their “smartphones” that they hardly have any time to talk with you. A bully at school is really starting to pick on you. You are afraid he might hurt you and are scared to go to school. One of your classmates was being made fun of online, and text messages are being sent around to almost everyone at school who has a cell phone. You are at a party and the boy/girl you have a crush on offers you a beer. You’re typically an outgoing person, but you’ve been at college for almost two months and still haven’t developed any meaningful friendships. You’ve reached the conclusion that your roommate is obnoxious. You can’t stand living with him/her, but there is no way to change roommates until the semester ends. 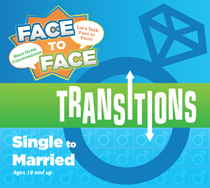 Real world scenarios help couples and those newly married to start great conversations about the transition into marriage and parenting. You and your spouse seem to be struggling with intimacy. Very rarely are you both “ready” when the time is right. Ever since you had children, things have been different in the bedroom. Your spouse seems to spend a great deal of time online, using various social media sites. You feel this “habit” is affecting your relationship. Click here for retail store purchases and wholesale pricing. If for some reason you are not satisfied with your purchase, please contact us at customerservice@harvesttimepartners.com so that we can address the concern. All games are made in the USA.